The SWE- Boston Professional Section & SWE – Boston University Collegiate Section present: Public Speaking Joint Professional & Collegiate Networking Night Professionals and collegiates are welcome to join us for our annual student networking night! Every November, members of local collegiate SWE sections gather with SWE-Boston professionals for dinner, networking, and a keynote speaker. Local students are especially encouraged to attend this event for an opportunity to meet with professional SWE members and other students! Our keynote speaker will feature the District Governor of Toastmasters, Sherri Raftery, who discuss some tricks of the trade with mastering public speaking to help you become a more effective presenter both in the work place and in the classroom. Here is what was written after our presention - we eagerly await our testimonial letters! November Professional Development Meeting - RECAP "Effective Public Speaking - Joint Professional and Collegiate Networking Night " On Thursday, November 12th, the Boston University section of the Society of Women Engineers hosted the annual collegiate - professional networking night with over forty engineers in attendance. The event was held on the 11th Floor of the Photonics Center overlooking the Boston skyline. After networking and dinner with several autumn-themed dinner selections, the main topic for the evening was "Effective Public Speaking" presented by two distinguished Toastmasters: Sherri Raftery and Mary Cheyne. Currently, Sherri Raftery serves as the 2009- 2010 District 31 governor, which includes Rhode Island and Eastern Massachusetts (consists of 3500 members and 160 clubs/chapters). 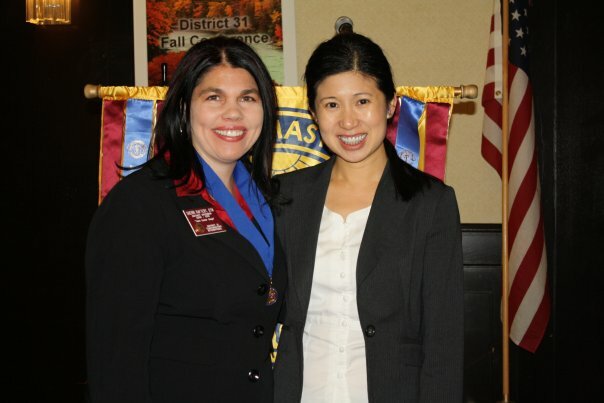 Recently, Mary Cheyne won second place in the 2009 Toastmaster's International World Championship of Public Speaking. She is also the founder of Magnetic Podium, an organization that uses the public speaking medium to help individuals uncover roadblocks that prevent them from reaching their highest potential. The speakers began with a quick warm-up exercise with audience members introducing themselves (another opportunity for networking between collegiates and professionals) with several volunteers offering to introduce themselves to all attendees to overcome their fear of public speaking. Before beginning the discussion of "tips for success" in public speaking, Sherri first shared several best practices from her vast leadership experience. She explained the importance of accepting responsibility and being open to taking on new challenges in unfamiliar areas. After taking questions from the audience, she turned the floor over to Mary, who presented the topic of "Effective Public Speaking." Mary explained the importance of practicing, always developing a plan B, and the difference between internalizing vs. memorizing speeches. Also she explained the best way to get rid of any nervous energy developed before a speech is to jump up in down or to do jumping jacks, in particular she suggested avoiding talking yourself out of nervousness (sometimes in makes it worse!). Mrs. Cheyne explained the importance of repetition in your speeches and utilizing pausing to not only make your presentations crisper, but also to emphasize specific points. Also she discussed several tips for engaging your audience by making eye contact with each person in the audience for 2-3 sentences of your presentation. Finally, she ended her best practice discussion by commenting "It's not about you, it's about providing an experience for the audience." Both presenters then conducted a "table topics" activity where the speakers asked a volunteer from the audience to answer a question, which they had to speak to for less than 2 minutes without any preparation. After each impromptu speech, they received constructive feedback from both Mary and Sherri. The evening then concluded with some further networking and discussion amongst collegiates and professionals.